When the right content is used at the right time – and in the right context – sales leaders have confidence they are creating amazing customer experiences, and marketing teams have real-time insight to maximize content ROI to properly guide sales. 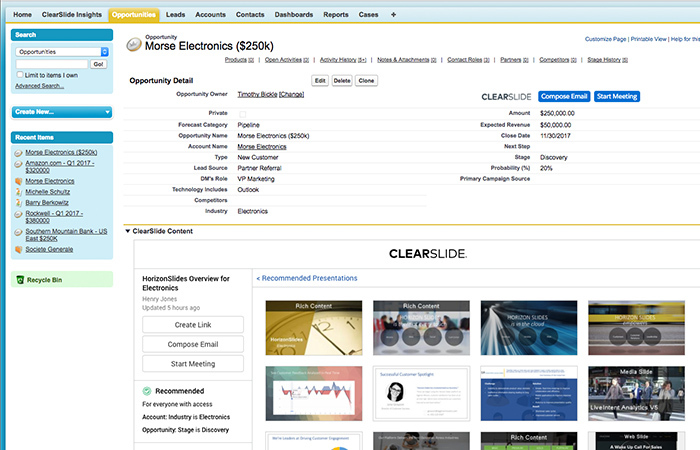 Included in the ClearSlide Polaris Release is a new rules-based, content recommendation engine that activates and brings an organization’s sales process to life. This allows sales reps to have contextual content deeply embedded in the applications they use every day to interact with customers – Salesforce, Outlook, Gmail, and mobile experiences. 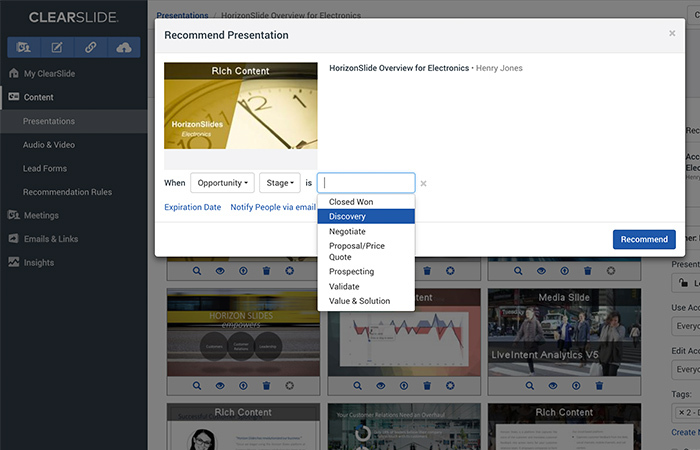 Reinforce your sales process by leveraging the content recommendation engine. Create rules that map recommended content based on sales stage, customer-facing role, geography, industry, and more. Easily find and use your recommended content (or access the entire ClearSlide library) in Salesforce and in ClearSlide email plugins. Identify the right content and rules based on robust cross-channel content engagement analytics. Recommended content is available on Salesforce records, in email plugins for Outlook and Gmail, and in Mobile Apps. 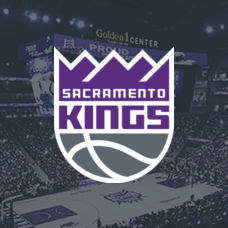 Reps can easily find and use recommended content based on their organization’s defined rules – from anywhere. 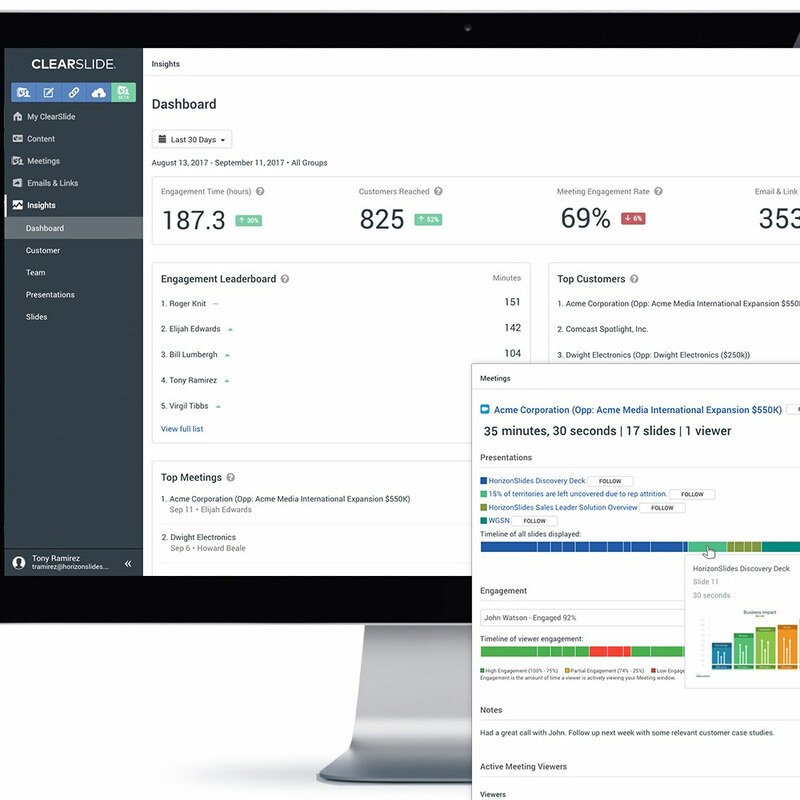 Reps can also access their entire ClearSlide sales content and collateral library, with full search capabilities, from Salesforce, Outlook, and Gmail. With “My ClearSlide” you have a powerful home screen and control center to take Guided Selling to the next level. 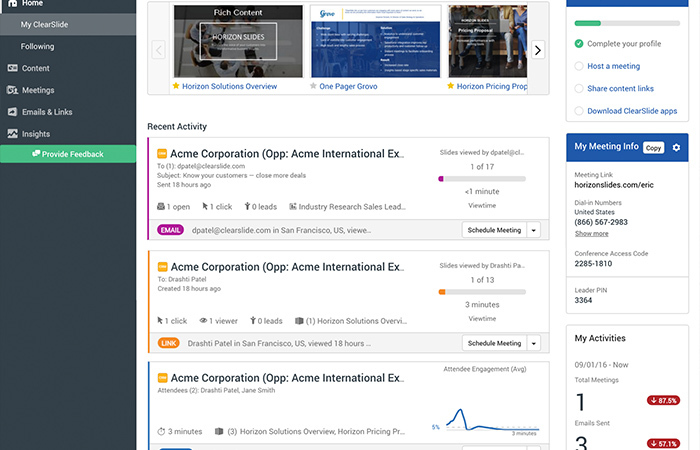 Activity Cards recommend next actions based on real-time buyer engagement across channels – from meetings, emails, campaigns, social, and content. 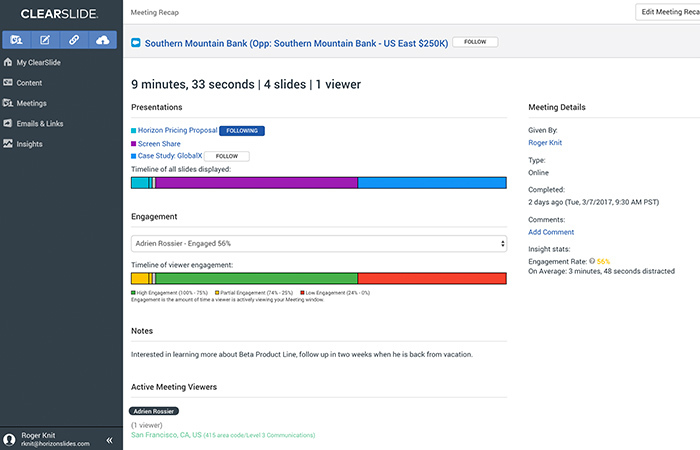 Next Action buttons for scheduling or starting meetings or emails are also surfaced in Salesforce, Gmail, and Outlook. Guided Selling standardizes sales processes and best practices to improve sales effectiveness. 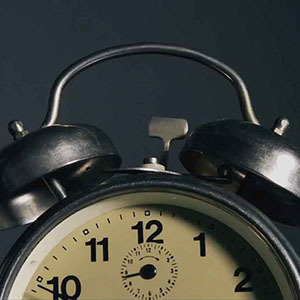 At the same time, sales teams need the capabilities to anticipate and respond to unique buyer needs. Engagement analytics integrate signals across communication channels to identify what buyers actually care about. View engagement analytics by contact or aggregate at account level to hyper-personalize follow-up.